Charge the Big Dog Rechargeable Bark Control Collar before using for the first time. Lift the rubber cover protecting the Charging Jack. Connect the charger connector to the Charging Jack. Plug the charger into a standard wall outlet. The display light will flash the sequence Green- Blue-Red to indicate that charging has started. 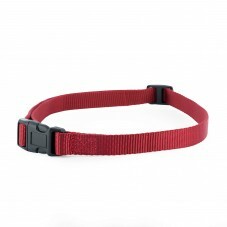 During charging, keep the Bark Control Collar in an open, well-ventilated area. The display light will flash red twice every 10 seconds to indicate that charging is active. When charging is complete, the charger will automatically shut off, preventing overcharging. The display light will flash green twice every 10 seconds to indicate that charging is complete. Note: The battery should fully charge in less than 4 hours. Remove the charger from the Charging Jack. The light will flash the sequence Red-Blue- Green to indicate the unit is no longer charging. 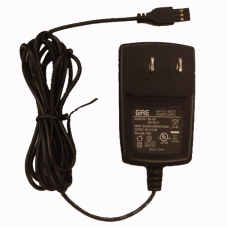 When charging is complete, replace the Charging Jack cover and unplug the battery charger. The Big Dog Rechargeable Bark Control Collar will automatically turn off when the battery charger is connected. Following a charge, turn the unit back on before using. Note: When the unit indicates that the battery is low (battery icon on the display indicates 1 bar or less and/or the light flashes red 3 times every 5 seconds) it is time to recharge the unit. If the battery pack is very low (i.e. been used too long or stored for an extended period of time) it may take some time for the unit to indicate that charging has started. If the unit does not indicate that it is charging after 1 hour, please contact our Customer Care Center. Average battery life is 3 to 6 months, depending on how often your dog barks. However, due to greater use during your dog’s training, your first battery charge may not last as long. To conserve battery life, turn the Bark Control Collar off when not in use. The Big Dog Rechargeable Bark Control Collar has three bark control settings that allow you to choose how corrections are delivered. The modes are indicated on the digital display by light color(s) and the numeric indicator. 1. The patent pending Temperament Learning mode tracks the number of corrections needed to substantially reduce (and in most cases eliminate) the number of nuisance barks. The system provides 10 levels of static correction. It begins with a low-level correction (Level 0). However, if excessive barking continues, the correction intensity will increase with each successive bark (to a maximum of Level 9) until the barking stops. This correction level becomes the starting level the next time the dog barks. Once your dog has learned to reduce his barking, the initial warning corrections are automatically reduced. The Progressive Correction mode starts at the lowest level (Level 0) and progresses to the next level (to a maximum of Level 9) each time your dog barks within 30 seconds of the previous bark. If your dog does not bark again within 30 seconds, the correction level will automatically reset to Level 0. 3. The User-Selected Correction mode allows you to manually select the correction level (0-9). In User-Selected mode, always start training at the lowest level of correction (Level 0). Watch how your dog reacts, and if necessary, progress to the next correction level. Note: As a built-in safety feature, if your dog barks 15 times or more within an 80 second period, the Bark Control Collar will automatically shut off for 3 minutes. This safety feature is active in all three modes of operation. Note: When the operating mode is changed, the correction level is automatically reset to Level 0. The Big Dog Rechargeable Bark Control has a single Settings Button that allows you to turn the unit on and off, display or change the current correction mode, and change the correction level. The following table describes how to perform the different tasks. 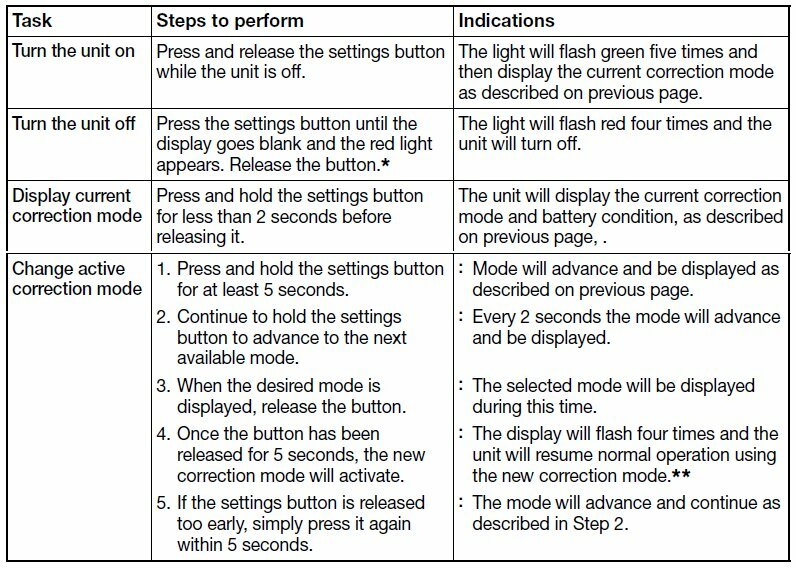 * If you continue to hold the settings button for more than 5 seconds, you will begin changing the correction mode. You must release the settings button before attempting to turn off the unit. ** The light will flash every five seconds to indicate the current mode.